I am snooping through old photo albums this week. 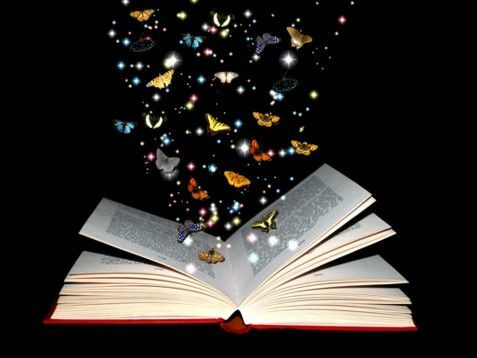 Memories that have lain dormant, some for decades, floated up from yellowed pages like butterflies on the move. Some pictures I remember the moments well. Others, not so much -- it's a little like looking at a stranger in a magazine, except she feels familiar. The reason I'm poking in these old photos is to collect images that represent the seasons and times of this little life of mine. You see, I'm turning the big 6-0 later this spring and, after watching two lovely photo videos created in honour of Queen Elizabeth's 90th birthday, I thought I would like to try that same idea. It should be easier as I only need to gather sixty instead of ninety pics, and I won't have quite as many crowns or fancy ball gowns to capture, so I should be able to pull it off. For the Queen's 90 Years in 90 Photos, click here and here. It's not so easy to choose just one picture to represent a year from dozens. And, yet, some years are scantily represented with not much more than the obligatory Christmas and birthday poses. Surely lives were fuller than that, but we didn't take pictures of everything in those years, the way we do now. We may think, too bad, but any childhood remnants that remain can tell us enough of the story to jog our own memory and be taken to places photos alone could not fully encapsulate. After all, these old pics brim with details of tales clamouring to be revisited. The air charges with emotion as suddenly a dozen connecting stories are ignited from the glimpses of former hairdos and eyeglasses and dresses, not to mention thoughts of 'do you remember when...'. You laugh out loud at silly photos where you are caught red-handed in a big pillow fight with old dorm college chums, the teddy bears we girls collected at the time as watchful souvenirs of fading childhoods. Oh yes, there arises the occasional wail of 'what was I thinking' when you catch sight of your grade seven class photo where you are wearing a pastel green top with light blue pants shored up by geranium red socks. You can read all about that tale here. When such memories are triggered, you feel like Alice falling down the rabbit hole -- you could be gone a long time before you emerge back into the sunlight of day. Which is exactly what has been happening to me this week. 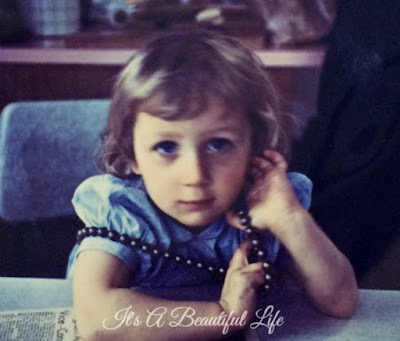 Since I'm linking to Five on Friday today, I'm sharing only five of those sweet, old photos... you'll have to wait for my birthday to catch sight of the finished project '60 Years in 60 Photos'. Here I am almost three years old staying with my dad's mother while my mom is in hospital having my little sister. My aunty, still a young lady herself at home with her parents, lets me play with her bead necklaces and I get to sleep in her bed at night. Alas, I repay that kindness by peeing in her bed one night; the memory of that is considerably faded, thankfully. My grandma apparently was a good cook and baker. I have no recollection of anything she baked, although I do remember that her kitchen was often fragrant with the warm spicy aroma of cloves. And, decades later, I only have to catch a whiff of the spice to remember Grandma's nice city kitchen. As you can see, I was quite taken with my aunty's beads -- I wore them with everything. My dad would stop to see me when he'd come into the city to visit my mom and my new little sister at the hospital. I had no idea what a little sister was, but I was soon to find out. In the meantime, Grandma's house was an interesting place to visit. There was tall, narrow door off the kitchen porch, which opened to the outside to the clothesline. And, I just now remember the little nook at the backdoor where the milkman dropped off the bottles of milk every morning. What fun to open and peer in and close that little door, it being the right size for me. This would have been all new to me, living out on the farm and getting milk straight from the cows. Oh, and there was the little girl I could play with sometimes; she lived across the street and I was allowed to walk across the quiet residential street by myself ... of which I felt very proud. 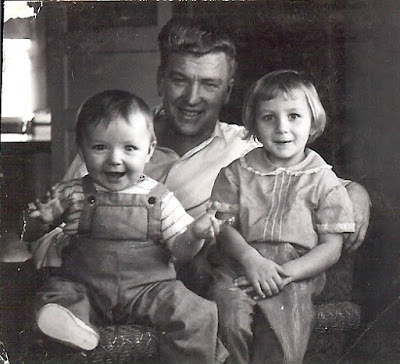 I loved my Grandpa as he would set me on his knee and ask me to show him my teeth. I'd smile widely and he'd admire immensely. He wore wire sleeve garters which totally intrigued me and I was allowed to play with them. According to Wikipedia, sleeve garters came into wide use in the late 19th century "when men's ready made shirts came in a single (extra long) sleeve length. Sleeve garters allowed men to customize sleeve lengths and keep their cuffs from becoming soiled while working or at the correct length when worn under a jacket". 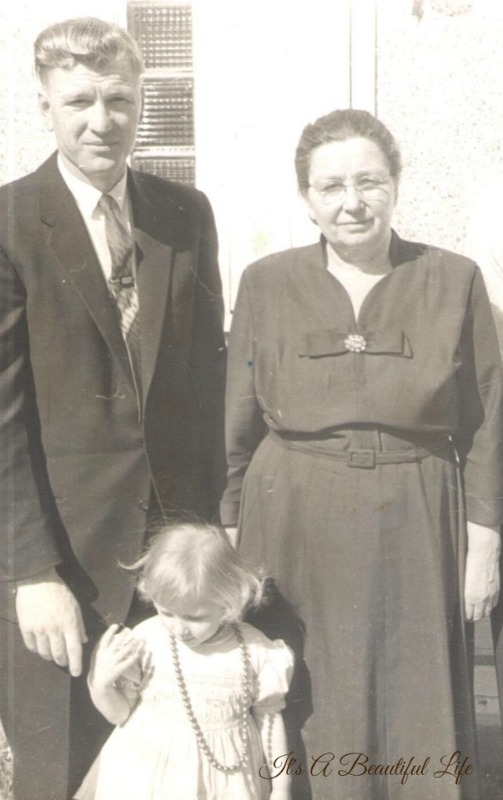 Here we are with our beautiful mom. Funny, my recollections of this little sister are vague at this early age. I would have watched my mom bath her and gently run water over her hair. I would have watched her being changed and maybe running to fetch the needed flannel cloth diaper. I must have loved this little sister dearly for I love her dearly still. I still have vague impressions of our cozy farm living room. I certainly remember that green bouclé couch with crocheted doilies everywhere. I loved doilies and as I grew I loved to watch my mom work the cotton threads into pretty patterns. Notice the orange pillow and zinnias? I could put those into my own living room and be right in fashion. My dad, handsome fellow that he was, has a grandson now who tries to get his hair cut to emulate his grandpa's jaunty look. Apparently that 1950's look is quite chic these days with young men. After my dad passed away a number of years ago, it was looking at these wonderful old photos that gave me so much comfort. A part of me wanted to go back there where we were all so happy and he was still my daddy, here with us, strong and good. Sis and I think we're all dressed up in our pretty dresses because it's her birthday. Somewhere in the family there is a cake photo where she's having great fun picking at the icing. 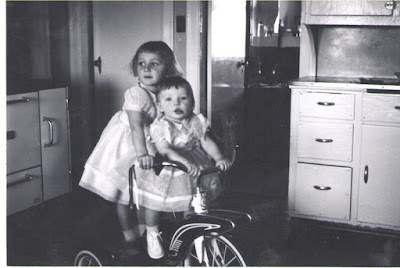 But here we share a little pose on my new trike ... it was my own new birthday present ... for we two sisters have the happy fortune to share the same birthday month. On that note, I wish you a most pleasant weekend. And, if you go in search of your own old photo albums, I recommend bringing a bag lunch and tea, you might be down the rabbit hole in a jiffy, enjoying yourself all afternoon. I enjoyed your photos, good memories. I love it!! brings back so many memories of my own ,I will be waiting for the next chapter. This was wonderful! I love reading about others history and looking at pictures. Pictures and smells bring back memories. I remember seeing doilies on couches. I even remember my mom making them. Great quote, "golden hinges The gate of Memory swings"
You look so much like your grandmother! Lovely old photos, precious memories. Thank you for sharing, Bren. I love looking at old photos too...you were a darling little girl! I love the idea of 60 years in 60 photos...I wish I would have thought of that when I turned 60 a couple of years ago. Mine was "Sixty is the new Forty" ...lol! I am the baby out of eight and there were WAY too many pictures to sort through for me to pick just 60! I hope you have a blessed weekend, Brenda! Thank you for sharing your sweet childhood photos, Brenda. I look forward to seeing your "60 Years in 60 Photos". Thanks for sharing such a loving tribute to the tid bits of your life. I enjoyed it! Brenda: A lovely post! I enjoyed so much the sweet photos of you and your family. What you are doing with the photos is a great idea - a treasure as the years go by. Also, as always your writing is simply beautiful! Very much enjoyed this post. Oh, you are just a young'un yet! Have fun with your project. I love this! Judging from your photos, it seems you look like your grandmother?? She is absolutely lovely.. such a pretty face. I love the way grandmothers dressed back then, dignified and tasteful. I like knowing that you lived on a farm and visited your grandma in the city....I had things just the opposite. I was a little city girl who visited grandma on a farm, and once screamed at the sight of an earthworm because I was convinced it was a snake (no one ever let me forget that, either). I look forward to more of your pics and remembrances! I loved seeing the photographs you've included here. This sweet post was very enjoyable to read! Love the pictures! What a wonderful 60th birthday project! Can't wait to see it! What a fun project, Brenda. 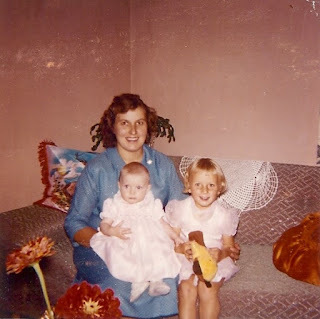 I've shared your experience of time a-flying while looking at old photos and remembering. You have some lovely photos to spark memories. Delightful as always. Bless you for sharing. What a wonderful commemoration for a special birthday! I love this idea! When we moved last year, I came across lots of old photos and family memorabilia. Oh, the memories they sparked! Enjoy your gathering of memories!! Such a beautiful number birthday ahead, and I think it's awesome that you're doing this project to help commemorate that important day. Aahhh- to be able to go back in time for just a day or 2. ::sigh:: Wouldn't that be fun? Such a lovely post. 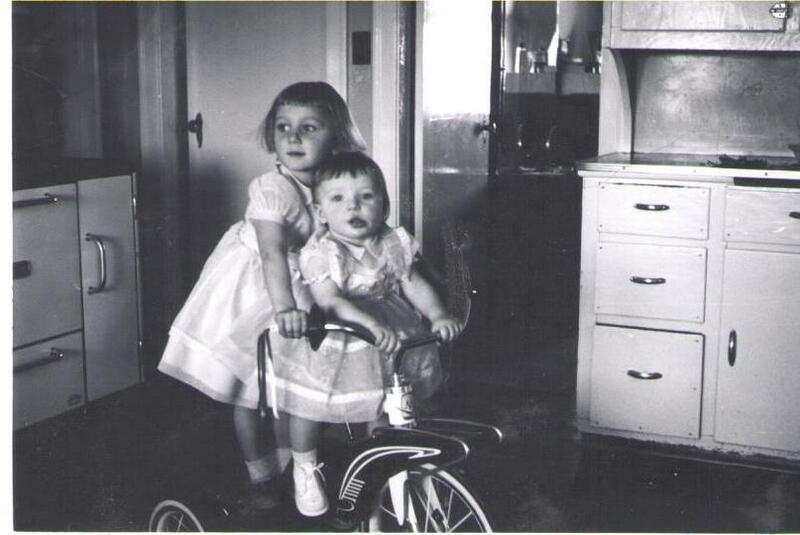 How lovely to see the last photo,"your and your little sister testing out the new tricycle". It is so sweet.You have a beautiful family. You made my heart warm today. Learning English has been one of my hobbies after my sons grew up.My teacher is from Canada. Brenda, what a sweet post! I love going down memory lane and your journey was filled with love and warm family times. I am thankful to have those kinds of memories, as well. I will be turning 52 tomorrow, so not too far behind you! The years roll by, but the memories, instead of making them bitter as they roll by, make them sweet like honey! I LOVE this idea. And I really enjoyed your photos and memories. I'm 58, so not far behind you. Maybe if I start now, I'll have all of my pictures gathered. I've been going through our basement, getting rid of stuff, and going through notebooks. I love the memories to. And sometimes I wish for the days of old. My parents are celebrating 60 years together tomorrow. One thing about those older pictures, at least they got developed! I enjoyed your post. Now I'm off to check out the Queen! How precious and how wonderful of you to share some of your sweet memories, Brenda. It's good to "fall down the rabbit hole" of memory from time to time, isn't it? I love your idea for marking your next birthday and I too, will look forward to your 60 photos for 60 years! Hugs, sweet friend. Dear Brenda - so glad I didn't miss this post. It was priceless. I turned 60 this past year and am still getting acquainted with that particular vintage. Maybe I need to go revisit some of my old photos as well. I just might discover the child that has been misplaced. :)! Have a blessed day. Will be looking forward to seeing more of you in the coming year.